The city of Heredia is the capital of the province. The canton, except Varablanca district, is part of the greater metropolitan area of the Central Valley. The city of Heredia was inhabited by indigenous Huetar. The central part of the canton of Heredia is geologically formed with volcanic rocks, such as lava and pyroclastic knucklebones. The name of the canton is attributed to King Barva. But some people believe the name comes from the indigenous voice “Barvak” which already existed in the region before the arrival of the Spanish. The city of Barva is geologically formed by volcanic rocks of the Holocene epoch, Quaternary period. The county is part Barva geomorphic unit of volcanic origin which is divided into two sub-units, called Volcán Barva Volcano and Fill, Central Valley. Santo Domingo the third canton in the province of Heredia, Costa Rica. Santo Domingo is the capital city of the canton. According to a government resolution of October 28, 1856 Santo Domingo was declared as a canton. It was originally inhabited by the nation of Huetares, who settled in the Valley of Barva, a region that was a Spanish settlement, located between the river and the mountain Virilla Avocado. The county is part of the greater metropolitan area. The main agricultural crops are vegetables, coffee and sugar cane and livestock. The canton of San Rafael is geologically formed by volcanic rocks of the Holocene epoch during Quaternary period. EI canton of San Rafael is part of the volcanic geomorphic unit, which is divided into two sub-units, called Fill and Barva Volcano Volcanic Central Valley. 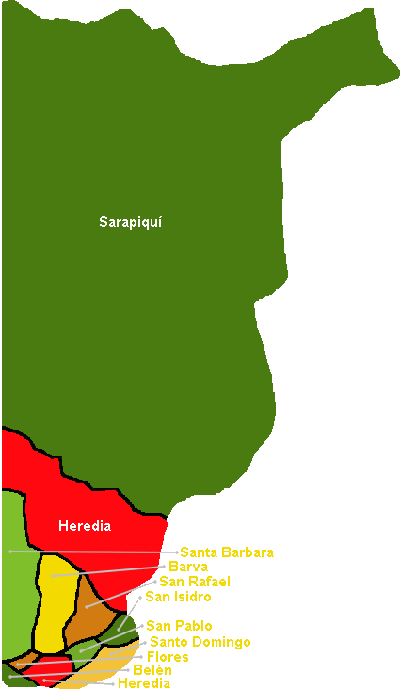 San Rafael was established as a canton of the province of Heredia province on 28 May 1885 by the Law No. 9.